The model year dominates the calendar for the automobile industry. The year begins when the factory decides it should. Production and registration statistics, however, generally follow the regular calendar and thus seldom accurately reflect how many cars of one or another year's models are built. The production figures at the bottom of the previous page reflect the total of '79 models made during the spring of 1979, and '80s made during the fall. In the case of Saab 96 all of the 1980 models are counted among the units built in 1979. In January of 1980 the Saab 96 finally expired, twenty years after it started and 30 years after Saab, with the original 92, begun the history that is being recounted in this book. Of course there is always a lag between production and retail sales, but it didn't take long until the 96s were sold out. Only 967 were registered in Sweden in 1980. The end of production was marked by a farewell edition of 300 in Aquamarine Blue metallic paint, with silvery alloy wheels and deep plush upholstery. It started with green in 1950 and ended in blue. The largest annual production of the 96 was reached in 1965 with over 40,000 units. Total production for the entire run was 547,221. If you add up the total from the 92 through the 97 - all of them closely related - the number was 740,826. The only thing actually showing a difference between the regular 1980 models of the 96 and the '79 models was the chassis number. 1979 was a relatively good year for the world's automobile business, but the same cannot be said for 1980. Demand for new cars decreased drastically, and this led to cutbacks in both production and marketing areas. The biggest decreases happened in America and in the leading industrial nations of Europe. Major reasons were the rising gasoline and oil prices, and a general recession in the world's economy. Sweden too felt the downturn, but that didn't take away from the optimism and trust in the future among those who were responsible for product development and long range planning in the Swedish auto industry. The Saab Car Division could look back on a year with relatively good financial results, and had a modern, effective production system. What especially gave everyone the feeling of holding the strong cards was the new assortment of car models, all of which could offer the design, engineering and quality that appealed to demanding car buyers both in the home country and abroad. The change-over to larger and more exclusive types had been done calmly and methodically. The innovative spirit and self-sufficiency that have always been Saab trademarks, and that many times have resulted in design and constructions far beyond industry norms, helped to bring about this marked change in direction. Less than two decades earlier the Saab make represented a tough and small two-cycle car that used to win rallies, but was really too individual in style and character to win a mass appeal. In 1980 the emphasis was on other things. Saab was taking its place among the world's most prestigious car makers and was competing primarily in the up-market segment where the car's quality counts far more than the figures on the price tag. 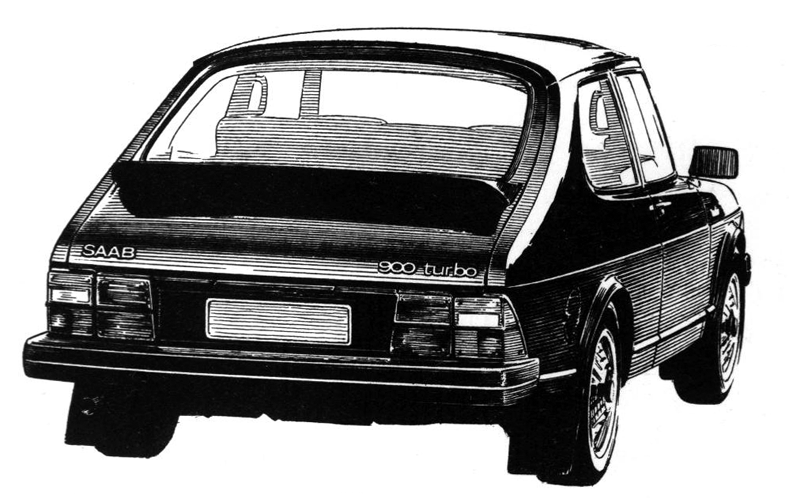 The Number One status car was 900 Turbo. 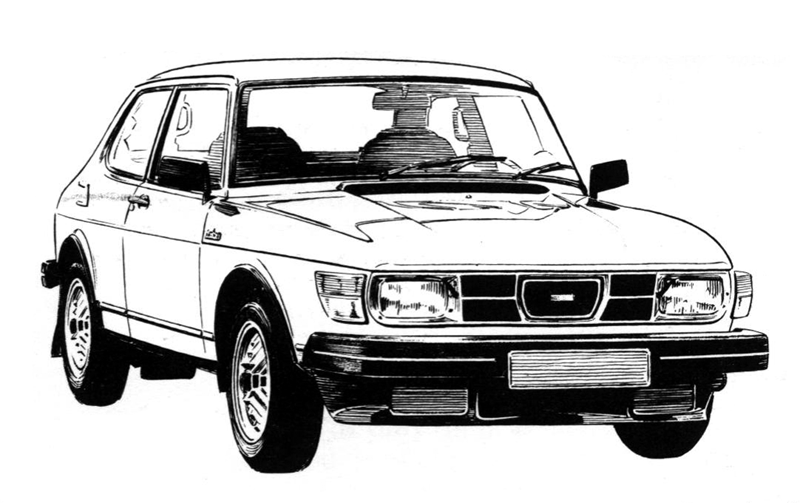 Every fourth Saab exported in 1980 was a Turbo. In USA the Turbo share was 33 percent; in West Germany 44; in Great Britain 20; and Italy all of 90 percent. The end of the 96 came with the start of the 1980s. Almost everything had been changed and altered during the years, but the style was still there. In its final version it came with light blue metallic paint and alloy wheels. But high market shares aren't exactly the same as high total sales. Even though the Turbo and other 900 models stood up well against the competition, Saab, like most other car makers, suffered a decrease in demand and was forced to cut back production. During the year an average of only 75 percent of factory capacity was utilized. The total number of invoiced cars reached 66,100; total production stopped at 65,754. Some of the decrease could of course be attributed to the demise of the 96, but this was mainly only in the sales in Finland and Sweden. In the country" where the 96 was last made, Finland, Saab sales dropped to barely half of what was sold in 1979. The loss was over 5,000 units. In Sweden, Saab pretty much maintained its share of the new car market, but since the entire market dropped by 22,700 units (10.6%) it also meant a sizeable drop for Saab. Of the drop of 4,100 Saabs 2,600 were attributed to the end of the 96. In Scandinavia where the 95 and 96 had been sold in the thousands it was not considered too wise to abandon those customers who liked Saab but wanted to stay in the size and price classes below the 99. Since Saab couldn't cover that market any more, a search began outside of Sweden for something that could fill the gap. The aim was to find a small, sporty car, that also could serve as a successor to the 96. 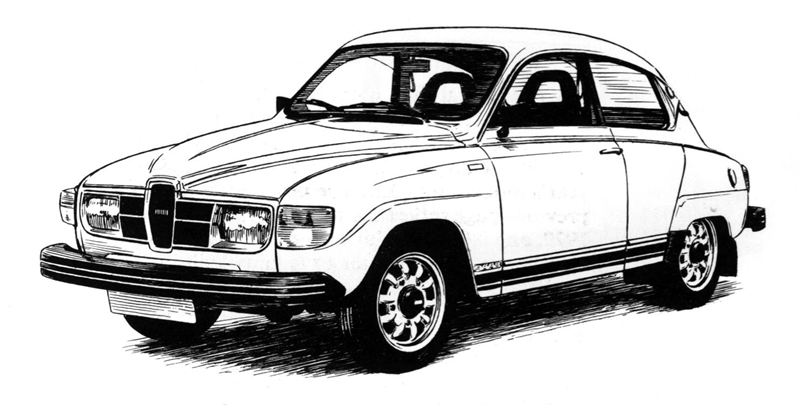 It was important that whatever was found had front-wheel-drive and generally represented a construction philosophy like Saab's. Of course the 'adoptive' car also had to be safe, reliable and robust. The 99 range for 1980 consisted of 2-and 4-door sedans in the GL/GLs/ GLi ranges. But all variants weren't sold on all markets. The Scandinavian types had a few remnants left from the earlier L-types, but offered upgraded interiors and baggage compartments. All had bumpers of the same type as the 900. Early in 1980 a series of 2-door Turbo 99 were produced in green and white paint, with black window frames, tinted glass, front spoilerand "Inca" wheels. 300 of them stayed in Sweden, the rest went to other European markets. Another Lancia still in its design stages seemed a likely candidate for the other new Saab import. Its construction could still be steered in some areas to make it suitable for Scandinavian conditions. The cooperation was soon started and a Scandinavian version was prepared to be sold under the name Saab-Lancia 600. Sales started during spring 1980. When the 1980 model year began in August 1979, the Saab line-up did not include any 99 models with turbocharging, but despite this a series of 99 two-door sedans with turbo were produced soon after the first of the year. At the same time 99 GL came out with new gear ratios - same as in the four-speed Turbo - that made it both quieter and more economical than earlier ones. The most important of the modelyear news for 1980 affected both 99 and 900. The seats had been redesigned and offered both better comfort and safety. Head restraints were adjustable and allowed better vision for rear seat passengers. Also important was the introduction of Saab's first five-speed transmission, which was installed in all five-door turbos, and was optional for EMS and three-door Turbo. The GLE model was now also offered with a manual four-speed transmission for the first time. Earlier it only came with an automatic. Among exterior distinguishing marks on the 900 were the larger tail light assemblies and the same grill for all car versions. New lower side moldings, among other things, set the 1980 99s aside. GLE: Five doors, fuel injected engine, manual or automatic transmission, full wheel covers, electrically controlled rear-view mirrors, tinted glass, luxury interior, gas filled shocks, usually also sunroof and power steering. All 900: Same grill as 1979 Turbo, space-saving spare tire, doubled tail lights, black moldings around wheel wells and rear lights. Turbo: Black window frames, rear spoiler (not on U.S. five-doors). Black color very popular. Even though there wasn't that much new in the regular models, Saab continued its active development work, and in February came one result of this: the Automatic Performance Control system, which automatically adjusts turbo engine boost to the quality of the fuel used and got world-wide attention. At the Geneva Auto Show, a Saab 900 Turbo with a four-door sedan body was unveiled. Saab competition activities continued to draw attention. In February 1980 Stig Blomqvist again won the Belgian Boucles de Spa... this time in a 99 Turbo. While this speedy Saab got lots of publicity for the make, some other speedy Saabs started running back and forth on military and civilian air fields. With built-in instrumentation they measured the friction on airport runways. The first Saab Friction Tester was delivered in 1978. It has been followed by many others.